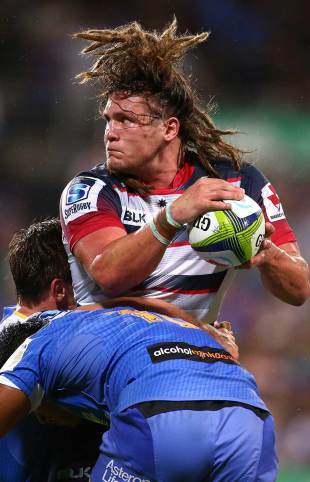 Reece Hodge bagged two tries on a remarkable Super Rugby debut as Melbourne Rebels claimed a 25-19 win over Western Force in brutal conditions at nib Stadium in Perth, where the temperature had touched 40C earlier in the day. The Rebels lost fly-half Jack Debreczeni before the match, and his replacement, Mike, Harris lasted just 31 minutes before limping off. Hodge, a winger who started at full-back, moved into the key playmaker role at times, and the 22-year-old responded with a try in each half and an important sideline conversion. Centre Tamati Ellison set up both of Hodge's tries with some excellent lead-up work. The Force had promised to unleash a new attacking game style, and they duly delivered, but a host of handling errors and turnovers cost them the chance to do much damage. Jonno Lance scored all of the Force's points with a try, a conversion, and four penalties. Rebels captain Sean McMahon said "the heat put us in a bad way at one stage but the boys come through strong there in the end". "They came out hard and gave us a run for our money the whole way through there. Force captain Matt Hodgson said his team "in patches we were good [but] we let too much ball slip and played too much footy down our end; too much loose ball". "But you could see our new style coming to fruition there and we're looking good the more games we get." The first 25 minutes made for ugly rugby as simple errors and penalties dominated play, with both sides struck down by key injuries as the half progressed. The exit of Harris forced another reshuffle for the Rebels, while Force skipper Matt Hodgson was forced off under the blood rule after receiving a nasty gash to his head. Hodge opened the scoring with a penalty and then scored the first try in the 31st minute after Ellison had sliced his way through two Force defenders, but the Force, who had led with two penalties from Lance, reclaimed the front when the playmaker crashed over in the 35th minute. The Rebels hit back on the stroke of half-time when flanker Adam Thomson touched down in the corner. Force centre Kyle Godwin was struck down by a leg injury early in the second half, and several team-mates started to cramp up on a hot, muggy night in Perth. The errors continued to flow for both sides before the Force closed the margin to one point when Lance nailed a penalty in the 60th minute, but Hodge ensured his side had the last laugh with his 63rd-minute try.